What a blast! We finally got to meet Abby's brother Luca, only to discover he was a murder suspect. And Tony has split from Zoe! The first half of the joint NCIS/NCIS: New Orleans tale provided a satisfying and mostly self-contained setup for a compelling story involving a Russian agent named Eva, a bunch of dead bodies and an exotic kind of poison. NCIS Season 13 Episode 12 cast a doubtful light on Abby's brother Luca, who became the prime suspect in the poisoning of the inhabitants of a private plane, right after it was forced into a crash landing. The crash was ironically induced by Abby herself. The writers for NCIS continued their welcome habit of providing bite-sized pieces of the unpredictable story after that, involving the pursuit and capture of Luca, the identification of the Russian agent he'd been helping, the introduction of the core of the case, an initiative entitled "Project Manteray," and the poisoning death of Pavlenko. The hook at the end, where Ducky and Palmer got cut off and stopped at gunpoint by men with machine guns was the icing on the cake. There was no way you could just end it there and wait for next week's episode: that scene pretty much forced us to continue on to watch the second half, on NCIS: New Orleans. Now that's a way to run a crossover story! The creation and fleshing out of Luca Sciuto was well done. Kudos have to go to both Tyler Ritter, who played Luca, and Pauley Perrette, whose enthusiasm as Abby gave us a lot of clues into the composition of her flighty and extreme Pollyanna-esque brother. Actually, his bright outlook became a little irritating after a while, given his religious admiration and support for Eva, a woman who, from all indications, had simply seduced and used him mercilessly. His request to Abby that she accept him, sunshine, unicorn farts and all, made me grind my teeth a little. If I'd had a brother who said that, I'd fling a butterfly net over him and call it a day. Seasoned viewers of NCIS would of course have reserved judgment as to Eva's culpability in the murders, knowing full well that nothing is ever as cut and dried as it seems. So perhaps Luca was right to keep faith with her, despite all evidence that she was out and out evil. I was certain that Blye CFO Dalton Greenbrick had something to do with the murders, given his easy propensity for lying. And given the fact that the actor playing him – Bryan Blatt – was so well known, particularly from his Mad Men days. It's really too bad we lost Counselor Anton Pavlenko. Gibbs and company need a frenemy like him; someone who acts as a sometimes-friendly foil; a man whose motives are often murky at best. Without getting into it too much, there may be a decent alternative in his successor, who we would go on to meet in NCIS: New Orleans. The other surprise was Tony's low-key announcement about his split with Zoe. That came out of the blue but didn't create quite the waves with us as it might have, had we gotten to know her a little bit. The news came as an anticlimactic beat. You could hear the NCIS viewers all expressing a collective "huh." Creatively, there came some news last night that overshadowed this great NCIS and NCIS: New Orleans crossover story. After 13 seasons of NCIS, Michael Weatherly is signing off. I'll be honest: having read that news today, it was difficult to retain focus. It's likely we'll all be watching him closely until the end of the season as we begin to wonder how they'll introduce his exit from the show. There was no explanation as to why Pavlenko's agent had been burnt beyond recognition and left on the plane. It's kind of weird, really, since presumably the passengers became poisoned after takeoff (as, you know, it's really difficult to make a plane take off without the help of a breathing pilot). So why would they fly with a dead guy? It was fun to watch Abby get exasperated with her brother's impregnable anti-logical Pollyanna outlook. I hope we see more of this guy. Tony and McGee's joint response to Bishop when she asks them what they're talking about: Star Wars. The startled looks on both of their faces as they realized they were on the same wavelength was hilarious. NCIS Season 13 Episode 13, entitled "Déjà Vu," will air in two weeks. 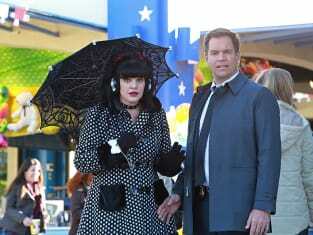 As always you can catch this episode again when you watch NCIS online. Now over to you: what are your thoughts on this half of the two-part story? What are your thoughts about Luca? Were you surprised by Tony's announcement? Hit us up in the comments!